Since I made this tart a couple of days ago, I've a) eaten it all, and b) realised it's my favourite recipe of the year so far. That's because it's wonderfully simple to assemble, the flavours are brilliant together, and it looks pretty impressive, too. At the moment, I'm at that stage where I think I could eat it every night for the rest of my life. 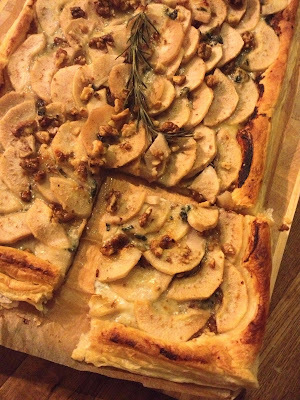 Buy the puff pastry (my aforementioned life is just too short to bother my arse making it), chop up a few pears and some walnuts, sprinkle a bit of blue cheese and bake - that's all there is to it. I made a HUGE tart, just because, but you can make smaller ones, round ones, whatever. Just follow the basic principles below and you'll be fine. Unfurl the pre-rolled puff pastry onto a flat surface. Sprinkle most of the Dolcelatte (you just need to keep a tiny bit to scatter over the top of the pie once it's assembled) over the pastry, leaving at least a centimetre gap all the way round the edge. Add a generous handful of walnuts (again, leave only a few to garnish before baking). Take your pear halves, and slice them fairly thinly to form little semi-circles. Arrange these atop the cheese and walnuts, in whichever configuration takes your fancy. Scatter the rest of the cheese and walnuts, then brush the visible pastry around the edge with a little milk. Season with pepper, drizzle a little honey across the top, and add a sprig of rosemary if you fancy (if you want a proper rosemary taste, chop some up and mix it with the cheese and walnuts before you start layering up the pears). Bake in the centre of the oven (either lay the baking paper directly on the oven shelf, or use a large baking tray for extra stability) for around 20 minutes. 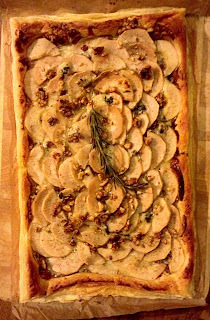 Once the pastry has puffed up around the edges and it's turned golden, and the pears have softened, your tart is ready. This tart tastes good hot and cold, so it's perfect for lunches and picnics as well as dinner. I may have even eaten a slice for breakfast. Ahem. I made puff pastry one, just to say that I could. These days the ready-made stuff is so good that you have people like Michel Roux Jr saying 'just buy it', so I feel no shame! 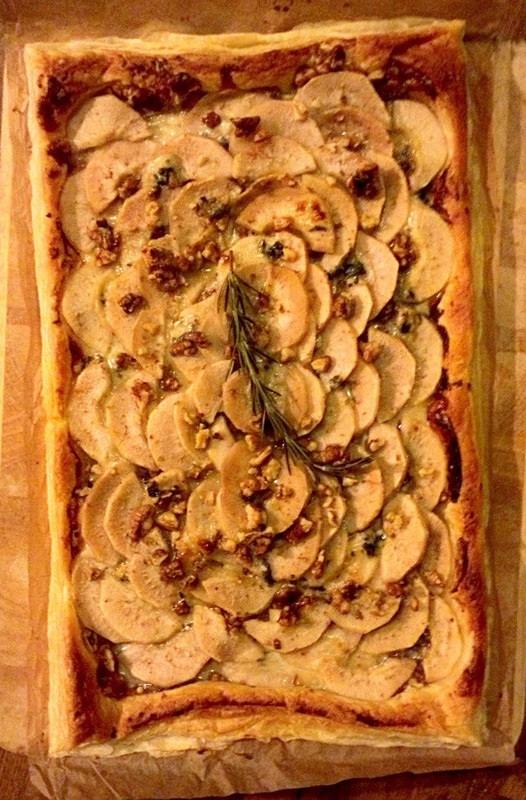 The tart looks lush--great combination of flavours! If it's good enough for MRJ, it's good enough for us!